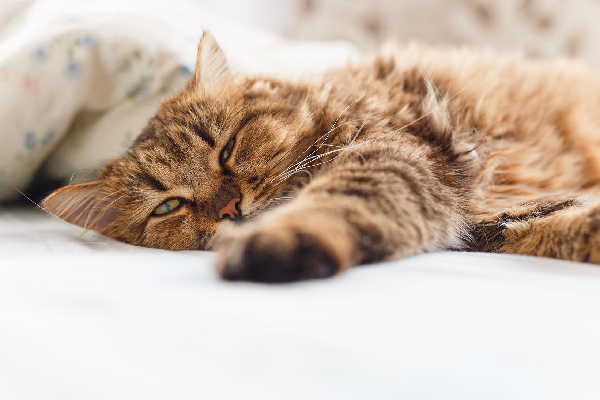 Next on The Scoop: Do You Unknowingly Reinforce Unwanted Cat Behaviors? Cats need to climb, but you want your house to look good, right? 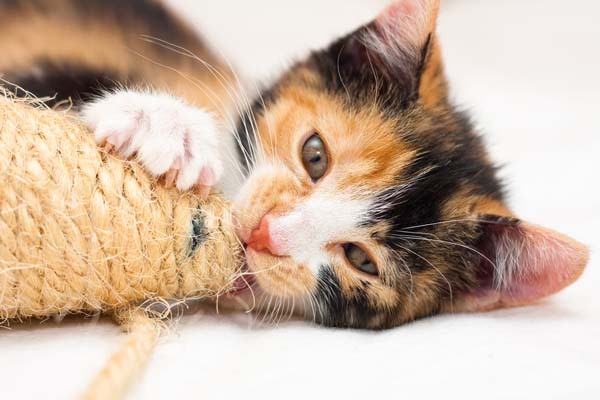 I’m here to tell you there are lots of stylish options for creating a cat superhighway that you and your cat will love. 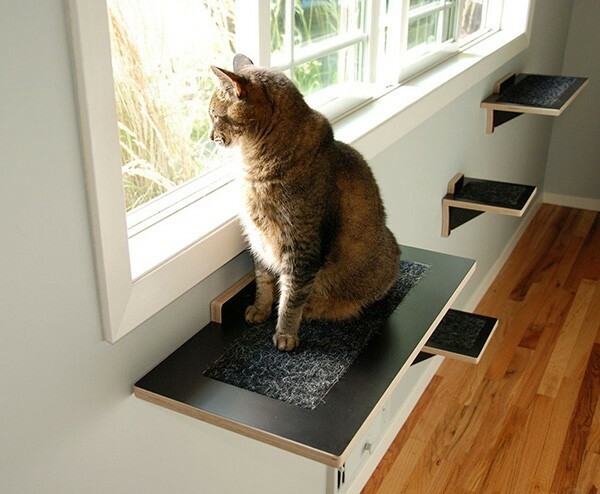 These perches will give your cat a way to get up high so she can survey her territory. Cats have a natural instinct to climb because, in the wild, cats are predator as well as prey, so being up high gives them an advantage in staying out of harm’s way and spotting their next meal. 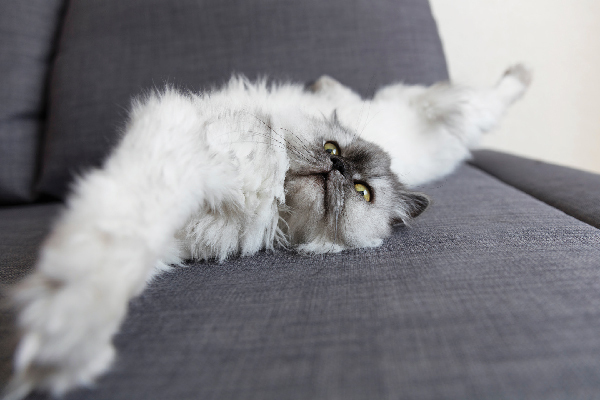 In your home, cats also want to be up high, maybe to escape the grabby hands of a toddler or to keep track of that pesky dog. If you don’t give your cat a place to climb, he will simply find his own way, which might not be to your liking. I’d encourage you to take a look around and find a place acceptable to you and your cat and create a dedicated climbing area. 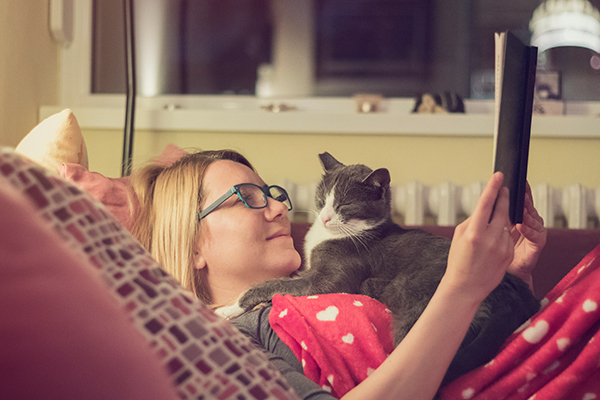 You could also connect to existing bookshelves or other ledges, just make sure to clear the clutter and add a non-slip surface, such as carpet tiles or a yoga mat, so your cat won’t fall when jumping on and off. For more tips, check out my post on Creating a Cat Climbing Wall with Shelves You Own. 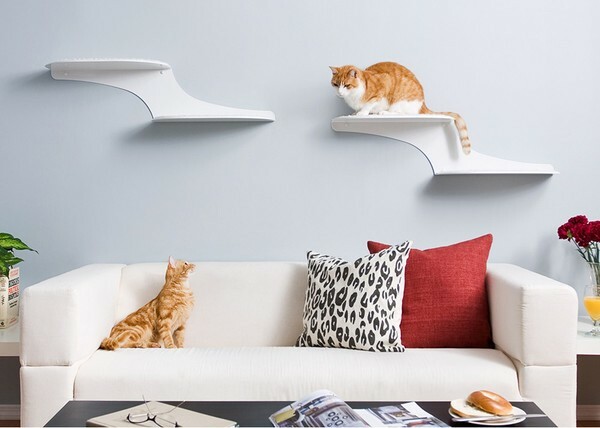 Here are some cat shelves that will lend a special design flair to your home while giving kitty what she needs to climb to a higher level. The Wave Perches from Urban Pet Haus are some of my favorites. These are sturdy as well as attractive. With a dark zebra wood finish and thick felt pads on top, these make a statement, plus cats love the curved surface. Available from Urban Pet Haus, $99.99 for the small size and $149.99 for the large. 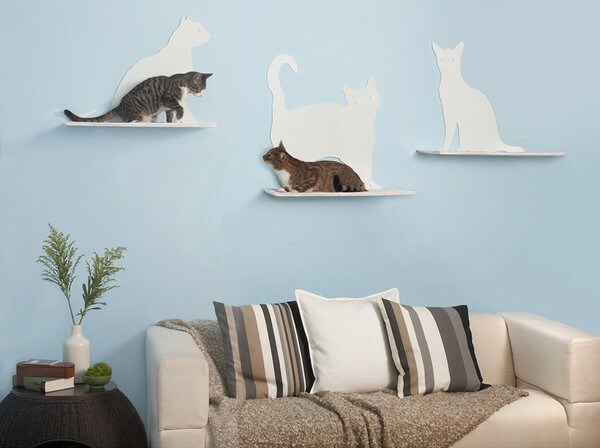 These beautiful cat shelves from the Refined Feline will have your cats floating on a cloud. 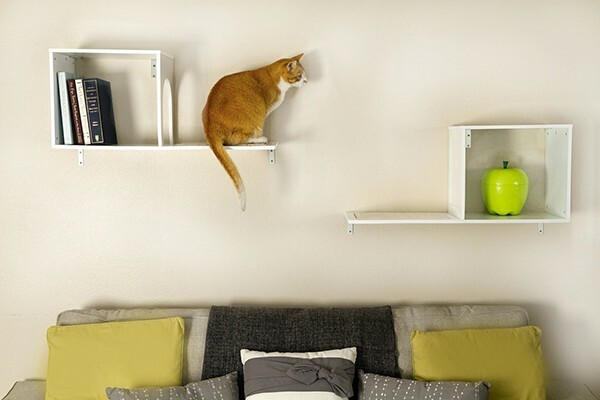 The Cat Clouds Cat Shelves have a sleek modern look with two generously sized platforms. They’re made from durable powder coated steel with soft cushions that attach using magnets (brilliant!) The Cat Clouds Shelves come in either right-facing or left-facing and in a variety of colors. $99.99 plus shipping from the Refined feline. The Sophia Wall Mounted Cat Tree from Designer Pet Products is a pair of cat shelves that mount on the wall creating a multilevel climbing experience. One shelf has a cubby that cats can access through a cutaway while the other is meant to be used for decorative items, but seriously, do you think a cat isn’t going to climb in there, too? I say hang these down low enough so your cat can access both cubbies. These come with carpet attached on the top to prevent slipping. Available in black or white finish for $109.95 from Designer Pet Products. 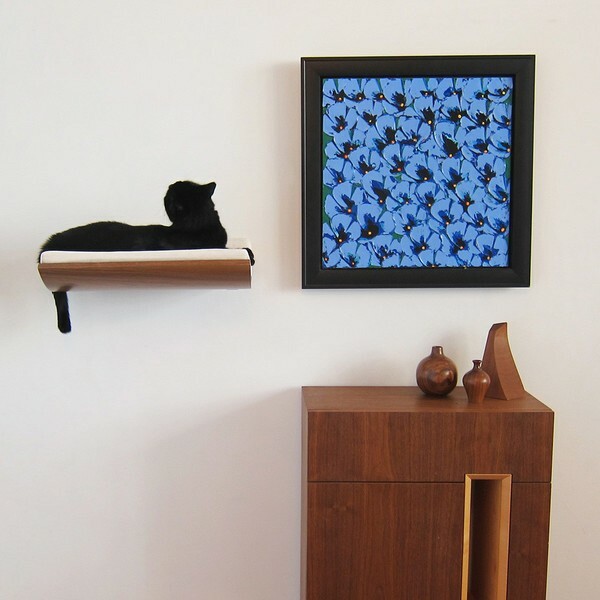 Square Cat Habitat makes several wall-mounted cat perches, including the Fremont Perch, the Burnside Perch, and the Hawthorne Step, all named after well-known bridges in Portland, the headquarters of Square Cat Habitat and the city where all of its product are handcrafted. You can combine the designs to make a fabulous climbing wall for your cat. The items also make great window perches so your cat can look out and watch the local wildlife. The Square Cat perches start at $50 and go to $130 depending on materials and finishes. Available from Square Cat Habitat. 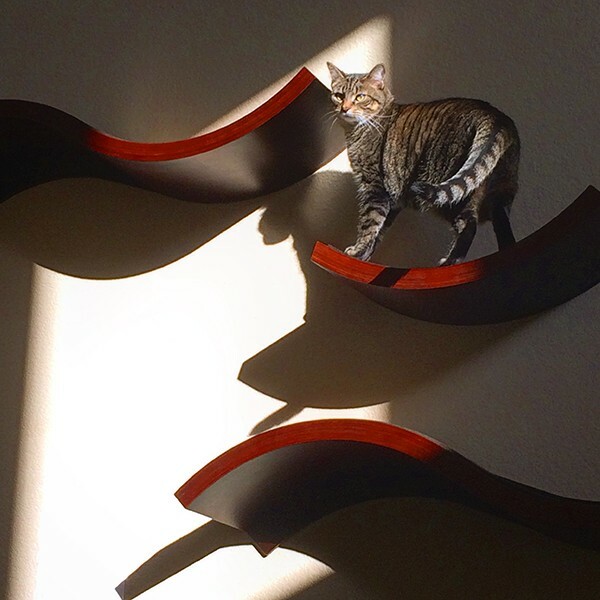 The Refined Feline also offers their fabulous Cat Silhouette Cat Shelves. Just like the Cat Clouds Shelves, these are made from powder-coated steel and have soft pads attached with magnets. There are three silhouette styles and a variety of colors. Individual shelves are $124.99 plus shipping, or you can get a set of all three designs for $324.99 from the Refined Feline. Finally, another favorite of mine is the Curve Cat Perch from designer Akemi Tanaka. This beautiful bent wood cat bed mounts to the wall with hidden hardware. It has a thick cushion on top that attaches with snaps and has a removable, washable cover (very important). The Curve Perch comes in birch or walnut veneer with three fabric options for the cushion cover. It’s $199 from Akemi Tanaka.